(CNN) -- If not for a lowly leech, Peter Alec Cannon might not be in the heap of trouble he's in now. DNA from blood in a leech found at a crime scene was used to convict a criminal in Australia. In what Australian officials are calling a first in their country -- and possibly in the world -- police used DNA extracted from a leech that bit Cannon eight years ago to convict him of robbing an elderly woman. "I haven't heard of it being done in Australia before. I am not aware of it being done elsewhere in the world," Pam Scott of Forensic Science Service of Tasmania told CNN affiliate ABC News. Cannon and an accomplice broke into the rural home of a 71-year-old woman in Tasmania, Australia's southernmost state, in 2001. They tied her to a chair, poked her with sticks, and robbed her of $504 (AUS $550), authorities said. Arriving officers found little in the way of evidence, except for an engorged leech on the floor next to the chair. "None of the police who were there had any evidence of a leech bite on them and neither did the victim. So it was logical that perhaps it was related to one of the offenders and it was taken on that basis," Inspector Mick Johnston told ABC. Samples of DNA taken from the leech were added to a database. The case languished until last year, when Cannon was picked up on a drug offense. Following routine, investigators cross-checked Cannon's DNA against a databank to see whether he was tied to other crimes. They found a match. Cannon, 54, pleaded guilty to robbery on Monday. He will be sentenced Friday. His accomplice has not been caught. 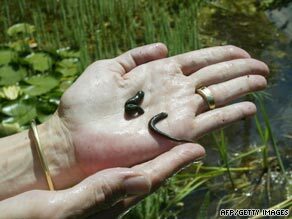 "I remember (the leech) being picked up. I remember quite clearly," Johnston said. "I remember a few jokes around the place after it was done from different people, who strangely haven't been in contact lately."